We all know getting a good night’s sleep is important for us to function as pleasant human beings. On holiday to catch up on your sleep? It could also be said that taking a holiday is a perfect time to catch up on your sleep…Sadly this is not always the case and it’s usually due to the poor quality of; the bed, the mattress or the bedding – or a combination of all three. The National Sleep Foundation https://sleepfoundation.org/sleep-tools-tips/healthy-sleep-tips suggests a number of ways to ensure a good night’s sleep, from a relaxing bedtime ritual through to a comfy mattress and pillows. When we created Keep Cottage and our new addition The Wood Store, we knew from bitter experience that the bed and bedding needed to be a key feature of our holiday home experience. We set out to create a luxurious sleeping experience to ensure our guests would have a truly relaxing and energising break with the result that they would want to come back time and time again and, in addition, recommend us to friends and family. As a result, and after masses of research, we specified king size beds with oak frames. These beds have robust slats with a natural flexibility that provide both comfort and super stylish looks. Once we began to investigate the multitude of mattress options we realised that to get a brilliant mattress we needed to invest wisely. After many hours; testing mattresses, talking to retailers and speaking to friends and family we opted to buy our mattresses from John Lewis their hotel quality mattresses (these mattresses cost three times the price of the frame but it has since proved to be a wise investment). At this point we were confident we had a good base to work on, and then we added cotton luxury protectors on the mattresses from “Soak and Sleep”. To these we added feather and goose duvets – the all season version (4.5 tog and 9 tog) which can be used individually in the warmer spring and summer months or joined together for autumn and winter time. As a result our guests are “as snug as a bug in a rug!” . Most recently we have invested in duvet protectors to protect the valuable duvets and to prevent any feathers popping out of the duvets. It would be foolish to say that pillows are just pillows… oh no its worse than ordering a coffee in New York! Selecting pillows was a BIG decision and everyone we spoke to had a big opinion on the topic. In the end we opted for a blended solution of a firmer base pillow with a medium top pillow, all pillows are feather and have 100% cotton protectors. Finally, moving onto our choice of sheets, this was simple they had to be top quality, be happy to go through an industrial wash process and still look fantastic at the other end once pressed and on the beds. To solve this we turned to The White Company for our linen, this has proven to be an excellent choice they are luxurious, look great and cope brilliantly. 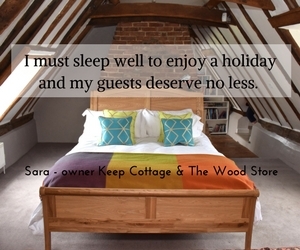 All of this hard work has paid off, we have had many guests singing the praises to the quality of our beds..
Another great space to visit – have a look at Sleepy Bliss its their Ultimate Guide to a good nights sleep!